Paul Bettany stars as Charles Darwin in "Creation." (Entertainment Weekly) -- People who invent something big and bold and earth-shattering -- it could be the light-bulb, rock 'n' roll, or the theory of evolution -- tend to be powerful figures with implacable, high-and-mighty egos. That's one of the reasons we like watching dramatizations of their lives. But "Creation," the story of Charles Darwin's struggle to bring his grand theory of evolutionary biology into being (survival of the fittest and all that), is one of those tepid, genteel biopics that's far too busy ennobling its hero to bother giving him any recklessly interesting personality traits. 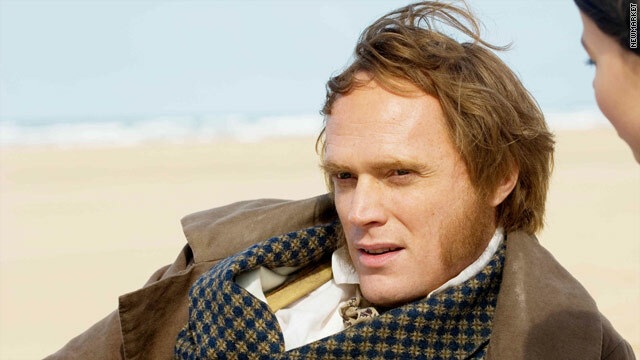 As Darwin, the normally fierce Paul Bettany comes off like a cringing, cowering country beadle right out of Dickens. He doesn't fight for his theory -- he apologizes for it. Darwin knows all too well that the revolution he's creating undercuts the concept of creation at the heart of the Bible. His wife (Jennifer Connelly), however, is a devout Christian, and he spends the movie twisting his soul in knots to please her and everyone else. Sticking true to his ideas has reduced Darwin to a quivering mass of ailments. But how did he devise those ideas in the first place? "Creation" is set in the late 1850s, when Darwin's conceptualization of evolutionary theory is already a done deal (though he still soaks bird carcasses in acid to study their skeletons). We're denied the pleasure of an "Aha!" moment -- or, for that matter, any real explanation of Darwin's thought processes. The movie, directed by Jon Amiel ("Entrapment") from a script by John Collee, is mostly rudderless domestic strife. Darwin turned the world upside down, but there was more drama seeing Greg Kinnear play the inventor of the intermittent windshield wiper in "Flash of Genius." As a form, the biopic needs to make the past feel like the present. It long ago evolved past waxwork tributes like "Creation."